Arlington, Va. – November 18, 2010 –Hampton Roads Sanitation District (HRSD) and Ostara Nutrient Recovery Technologies Inc. announced today that they have won the prestigious Innovation Award from The National Council of Public-Private Partnerships (NCPPP) for their Struvite Recovery Facility incorporating Ostara’s Pearl® Nutrient Recovery Process at HRSD’s Nansemond Treatment Plant in Suffolk, Va. The award was presented last night at NCPPP’s Annual Meeting Reception and Awards Banquet in Arlington, VA. Ted Henifin, HRSD’s General Manager, and Phillip Abrary, President of Ostara, were present to accept the award. “We are very pleased to receive the Innovation Award from NCPPP. Our Struvite Recovery Facility has given us the ability to recover nutrients that were a maintenance problem in our plant and turn them into a commercially viable fertilizer product with basically no additional costs to HRSD. Our partnership with Ostara fits well with our strategic objective of reducing human impact on the environment. Recovering phosphorus from a sustainable source – wastewater – to replace mined phosphorus does just that,” said Henifin. HRSD’s Struvite Recovery Facility, which opened in May, recovers phosphorus from wastewater recycle streams. The recovered phosphorus is transformed at the Nansemond facility into an environmentally-friendly, commercial fertilizer called Crystal Green®, which uses a slow-release formula to ensure that nutrients are absorbed by plants and thereby reduces fertilizer runoff from reaching and polluting fragile ecosystems. The NCPPP’s mission is to advocate and facilitate the formation of public-private partnerships at all government levels and to raise the awareness of the means by which government and business cooperation can provide the public with quality goods, services and facilities and the most cost effective basis. HRSD’s partnership with Ostara showcases a win-win relationship whereby Ostara’s Pearl process provides benefits to HRSD, its ratepayers and the environment. 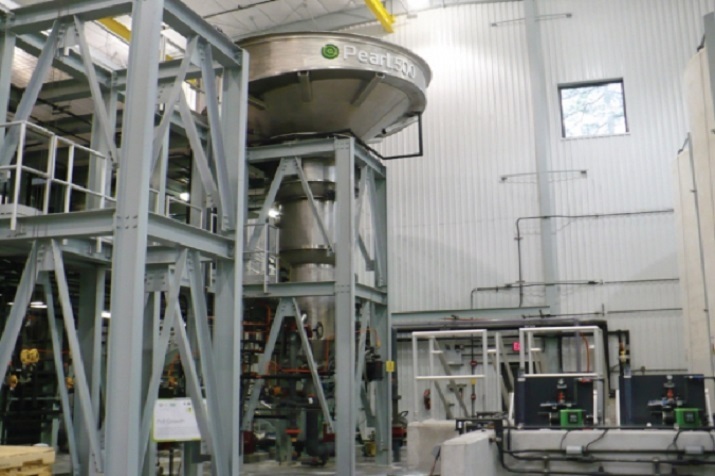 Ostara’s process increases production efficiencies by reducing nutrient recycle loads within the Nansemond treatment plant, and creates an environmentally-friendly premium fertilizer by-product that is marketed and sold by Ostara as Crystal Green. The Nansemond Struvite Recovery Facility is projected to remove more than 85 per cent of the phosphorus from solids recycle streams and has the capacity to produce more than one million pounds of Crystal Green fertilizer annually. The Nansemond Treatment Plant is designed to clean up to 30 million gallons of wastewater per day (MGD). It is one of 13 plants owned and operated by HRSD, a public utility that serves 1.6 million people in an area of over 3,100 square miles. The Nansemond facility discharges its treated effluent to the James River, a tributary of the Chesapeake Bay. The Nansemond Treatment Plant, which began operation in 1983, is a 30 MGD facility that features a biological nutrient removal process. The plant, located in Suffolk, Va., has received national awards for outstanding compliance with its environmental permits for 24 consecutive years. For more information, visit http://www.hrsd.com. Ostara Nutrient Recovery Technologies Inc. designs, builds and sells a new generation of water treatment systems – a nutrient recovery solution that creates value from waste by removing nutrients from wastewater and transforming them into revenue-generating, environmentally-friendly commercial fertilizer, called Crystal Green®. 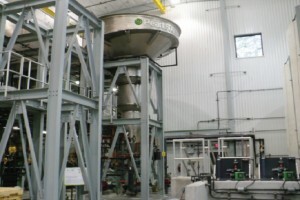 Ostara has three fully-operational commercial Nutrient Recovery Facilities in the United States – in Tigard (Portland) OR, Suffolk VA, and York PA; a demonstration scale facility in Edmonton, AB; and is constructing facilities in Madison, WI and Slough, UK. Dozens of technology pilot programs are underway in North America, Europe and Asia. In 2010, Ostara was named a 2011 Technology Pioneer by the World Economic Forum and a Top 100 Global CleanTech Company by The Guardian, a London-based media group. Ostara is backed by VantagePoint Venture Partners in the U.S. and Frog Capital in the UK. For more information: visit www.ostara.com and www.crystalgreen.com. The National Council for Public-Private Partnerships is a non-profit, non-partisan organization founded in 1985. The Council is a forum for the brightest ideas and innovators in the partnership arena. Membership is comprised of organizations and individuals from both the public and private sectors, with over 40 per cent representing public agencies at all levels of government. These members have experience in a wide variety of public-private arrangements, and serve as a vital core resource in the NCPPP’s diverse training and public education programs.